I’m glad you can never wear words out since i use that prayer so much!! I, too, have obsessEd over things that are out of my control. Have done it for years. It’s only recently that I have followed the immortal words of Elsa and “Let It Go.” It’s made me much happier and calmer. I still struggle with the control thing…obsess much? Uh yeah. It helps for me to pray (Yo Big Guy…could you handle this for me?) and sometimes to just fling my hands to the sky and act like I’m physically letting things go (another blogger told me about this one…I don’t know why it works but it does). Then if that doesn’t work I get really still and listen, God usually shows up a gives me a message or fills me with peace. I know this makes me sound like a nutcase but it works and has slowed my brain down so…I couldn’t care less what it sounds like! Lol. “Inspiration” is a great word for the year! Love it! 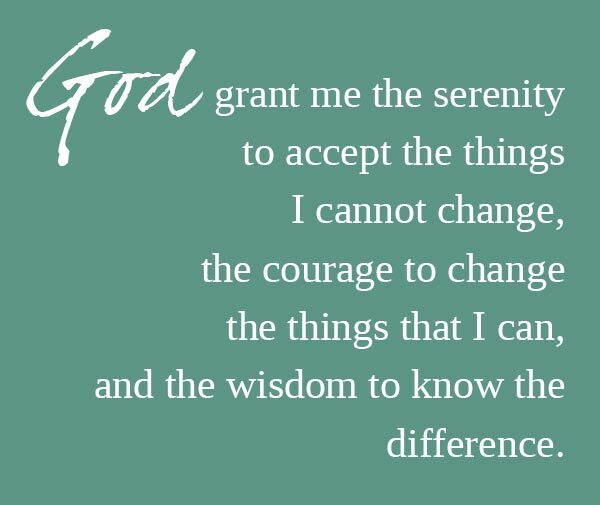 And I love The Serenity Prayer. We all have our reminder phrases that bring us back to serenity. Mine is “Allow everything to be as it is”, from Adyashanti. It’s a bit of a shift from letting go, it’s having no need to change anything or anybody, including me. No pushing/pulling. Truly, I really have no other choice. When I let things be, the obsessing can, on occasion, fall away and give rise to clarity. Oh I like that! Kind of a letting go of attachment. I went to an Adyashanti meditation group a few times and really enjoyed his wisdom. Thanks for sharing.